Letting someone in often means letting go of expectations. 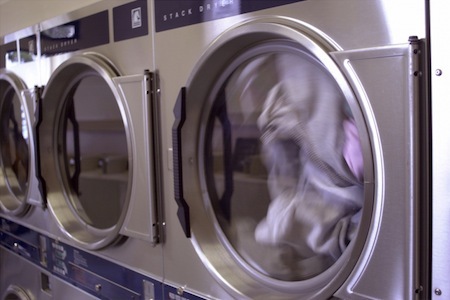 “You’re just using me for my laundry facilities,” he jokes when we set up what looks to be the ideal Sunday afternoon date. We’ve been seeing each other for a number of weeks but are still new. Hanging around in jeans and T-shirts at his place, watching a movie and eating popcorn will be novel. As long as we’ll be simply hanging out, I ask if I can do a load of laundry. I cringe inside, hating to ask for help. “Consider it this way,” I offer. “The time I don’t spend at the laundromat will be better spent in your company.” I’m trying to make it clear to both of us that by helping me, he’ll benefit, too. At 50 years of age and in the process of divorce after a 25-year marriage, this is the first time in my life I don’t have a washer and dryer of my own. And he is the first man I’ve seen beyond a first date since I was 22. Everything is new. A fan of chivalry, he carries my laundry in from the car—socks, underwear, and sheets—and dumps things in the washer, the sheets on top. “I kind of have a thing for sheets,” I defend, abashed. I can take months to find a set of sheets I like, but once I do, I will treasure that set for as long as they last. This set, purchased shortly after I’d moved out of my family home and started my life as a single woman, is my all-time favorite. The sheets are both crisp and thick. No wimpy, overly limp softness to them. I have never owned better sheets. “You could iron them,” he suggests when I tell him how much I like crisp sheets and how hard they are to find. “I don’t need to because this set is absolutely perfect. They keep that delicious crispness just on their own.” I don’t mention that the color of the sheets isn’t exactly right—they are a little too beige-y rather than crème for my preference. Still, they’ve moved into the inner sanctum of my heart despite their color flaw and are now one of my most-prized possessions. The highlight of my week these days is climbing into bed after laundering the sheets and feeling the sense of safety they bring. They remind me I can take care of myself in what often seems a harsh world. I don’t tell him all that. We’re still new. He dumps in laundry detergent, starts the washer, and we go to pick out a film. “You’ve never seen The Godfather?” He’s askance as we peruse his huge film library. “You cannot continue teaching anything that even touches on cultural criticism until we correct that.” He’s a film/TV documentary writer. I write books and teach creative writing at the graduate level. I don’t own a television and lament a woefully inadequate background in film. He graciously offers to serve as my mentor. Halfway through the movie he ducks into the laundry room to move things into the dryer, and then again toward the end. As the credits roll, I gather my things. He has an appointment this evening and will drop me home on his way. “I folded your laundry,” he says in passing as we tidy up. I let his words sink in. His folding of my laundry is simply a kindness, I know, but to me that act is so profound it shakes me to my core. I grew up caring for my siblings in the wake of my mother’s mental illness, doing all the housekeeping, shopping, cooking, and yes, laundry for a family of seven since I was about 9 or 10. As a very young adult, I went right into marriage and motherhood in which I fulfilled the same role. I cannot remember a time when anyone folded my laundry. Have I just done that? Maybe I’m learning. We make plans to see each other later in the week and I haul my bag of laundry up the stairs to my one-room over-a-garage apartment. I pull out my T-shirts, socks, and underwear. They are, indeed, folded. Not overly neat, not exactly the way I would have done it, but I marvel at the sweetness of the gesture. I pull down my Murphy bed from the wall to make it with my now-fresh sheets. As to be expected, the fitted sheet is more balled than folded. It’s impossible or stupid, can we all agree, to spend the time it would require to properly fold a fitted sheet? I shake it loose. Along the bottom of the sheet, in the pocket where the corner of the mattress fits and all across the lower third, are marks of baby blue. It looks as if a blue highlighter has stained it. But when I feel the marks, they aren’t just color but texture: gritty, clumped. Laundry detergent. I flash back to my date shoving the sheets in the washer, dumping in a scoop of dry detergent. I dunk the sheet under the kitchen faucet and try to remove the marks. While the clumpy-ness goes away, I cannot erase the blue. The whole bottom half of the sheet is marred. I get as much color out as possible and spread the sheet over my little kitchenette table to dry. The blue has stained patches of the flat sheet, too. I give it the same treatment. My beloved sheets, scarred with blue, are now dripping all over my hardwood floors. They’ll never be dry in time for bed thanks to their thickness, the very thing I love about them. What had I been thinking, to trust someone with an important task like sheets? I should have just taken myself to the damn laundromat and this never would have happened. It isn’t his fault, I know, but here I am, frustrated with wet sheets that will never look themselves again and water pooling on the floor. I take the fitted sheet—the wetter of the two—outside hoping the waning Southern California light might dry it, but only manage to get dust and dirt stuck to the wet parts. Damn. This is why you should never let someone in your life! They don’t do it perfectly and then you’re left with wet, stained sheets when all you really wanted was to climb into a freshly made bed and curl up. There is no choice. I’ll have to go to the laundromat. As I watch the sheets swirl in the porthole window and hope the bleach and extra hot water will do the trick, I wonder: What will I say to my date? Is it worth saying anything at all? I was the one to suggest bringing my laundry over. I was the one to put my sheets at risk. It isn’t his fault. And yet, I want to learn from this dating experience. My marriage was characterized by little hurts I kept hidden, too small to amount to anything—until they became everything. I don’t want to repeat that pattern, nor the one of blaming someone else for not doing things the way I would do them, for not, basically, being me. I take a walk while the water does its work and decide I’ll just let it go. There is nothing that needs to be said. We’ll see each other a few days hence and the sheets will be ancient history. But then my phone rings. Him. “What are you doing right now?” he asks, the question so direct there is no possible answer besides the truth. Life has conspired to make me tell the truth even when I’d hoped to stay quiet. “I’m at the laundromat,” I stammer. “Uh, the sheets…” I tell him what happened. I steel myself for anger, worry that he’ll get mad, start blaming me—after all, I was the one who’d suggested I bring over my laundry, so clearly it is all my fault. Every script from my marriage and childhood starts playing itself out in my mind. “Well, I guess no good deed goes unpunished,” he laughs. And that’s it. No big deal. We talk of other things and make plans for later in the week. He isn’t mad that his kindness didn’t turn out the way he’d hoped and I’m not stuck being mad that my sheets are messed up and I have to pretend that it didn’t happen, because for once, I simply told the truth. This is a whole new experience. I return from my walk and am afraid to look carefully at the sheets as I put them into the dryer, not wanting the relaxed feeling of the honesty I’ve just experienced to be ruined by my own expectations. The truth is, I still want perfect, non-marred sheets. But if they are permanently stained, I’ll simply have to live with that. As my marriage has taught me, there are some things that cannot be undone. The sheets feel hot and smell of bleach as I pull them from the washer. With a tiptoeing heart, I look them over, ready to accept whatever I might find, ready to not look for fault or blame or anything other than accepting this moment and the kindness this man has shown me. The blue has completely disappeared. But not only that. The sheets themselves, thanks to the overdose of bleach, now seem to be the exact color of crème I’d long wanted—not the overly beige shade that had bugged me from the start. My perfect sheets have become even more perfect. Currently writing “Look, Lean, Roll,” a book about women, motorcycles, risk-taking and authenticity, Bernadette Murphy has published three books of narrative nonfiction and teaches creative writing at the Antioch University Los Angeles MFA program.